Do you want to lose weight? Are you determined to meet all of your health and fitness goals this year? Do you find that every time you diet, you work and you work and you try to lose weight, but each time you step on that scale, it whispers something in your ear that you don't want to hear? Well, you may be making some of the common mistakes when dieting. But have no fear, because in today's post, I'm going to give you 5 diet do's and don'ts. Obesity is a major health epidemic in the United States. In fact, we have more obese people in this country than in any other country in the world. 160 million Americans are overweight or obese, and 40% of children are overweight or obese. Of course, obesity is linked to so many health problems, so many comorbidities, such as diabetes, hypertension, stroke. So it is important to maintain a healthy weight. If you are overweight, that means that your BMI, your body mass index, is greater than or equal to 25, but less than 30. If you are obese, that means your BMI is greater than 30. So what is there to do? You exercise and you maintain healthy eating habits so that you can get to a healthy goal weight. That brings us to the diet. There are many common mistakes that people make when trying to lose weight. 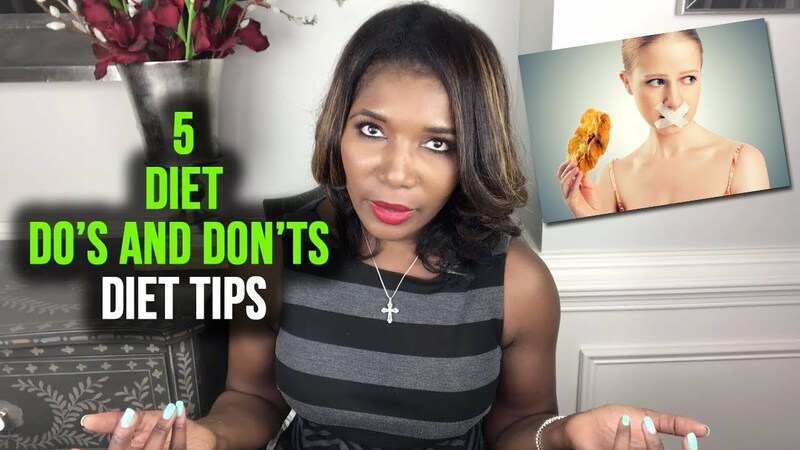 So today, I'm going to give you five do's and don'ts of dieting. Now if you're like most people then this is not your first time trying to go on a diet. You tried all kinds of things, you look up and you still aren't at your goal weight. So it's easy to be discouraged, but don't be, because you're not alone. First off, diets are confusing. People don't know if they should do low carb, high carb, high fat, no fat, 10 meals a day, 3 meals a day, 1 meal a day, keto, paleo, they don't know. So they are confusing, it's not just you. And then the very word, diet, can be psychologically oppressive. I mean just spell it out. D.I.E., T. And for a lot of people, the word diet makes them feel like they're having to deprive themselves, that they're suffering a loss. So there are a lot of things that go along with it. Another thing to remember is that even if you gained weight and you're now trying to get down from a weight you thought you could never get up to, you can't stop trying, because even though you try to stay under a certain weight and now you've got it up to 200 pounds, if you keep eating, if you don't get the physical activity you need, you can go to 220, you can go to 240, so don't be discouraged. It's a work in progress. What I do want you to do, do be encouraged, and remember that the diet is not a vanity thing, but it's for your health. You need to try to have a healthy weight, a healthy lifestyle, a healthy fitness level so that you can have a long life and a good quality of life. Don't lie to yourself about what are you eating. 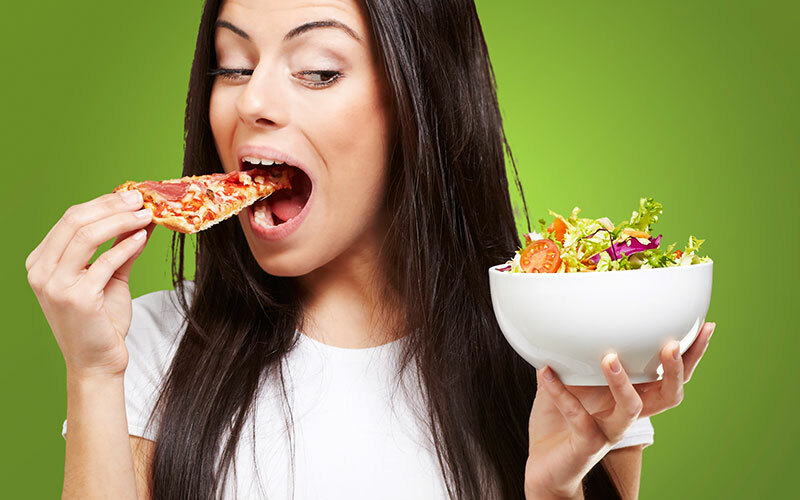 Some studies show that up to 50% of people underestimate their caloric intake. You'll be surprised. I have so many patients who come up to me and they're like, Dr. Frita, I don't know why I'm gaining all this weight? I eat like a little bird. No, you don't, no you don't. You're not telling the truth to yourself. If you are gaining true fat weight, then more likely than not, you are eating an excessive amount of calories or you're eating the wrong things, such as sugars and processed foods. And you're not lying to yourself on purpose, but a lot of people really do get selective memory when it comes to what they eat, to how many calories they take in. For example, you may remember that you had a nice piece of salmon and a kale salad for dinner, that's what you planned. You remember it. But you may forget that while your son didn't finish his kid's plate, you finished off the fries for him. When your daughter left some chicken nuggets on her plate, you ate those too, but you don't count those. Also you may not remember that after you ate your kale salad, while you were on the phone with cousin “Pookie” and not paying attention, you sat up there and ate about 10 of those little mini Snickers, and now you feel like you're fitting in a Snicker, so don't lie to yourself about your calorie consumption. Be honest with yourself. Hold yourself accountable for what you eat, because unless you recognize that there's a problem that you're eating too much, there's no way you can actually change it. So you should keep a food diary and write down the things that you eat and the portions that you eat. You should also read labels. Pull up that bag of chips and see how many calories it has. It may not be worth it to you to eat that bag of chips. And you can download a calorie counting app. So don't lie to yourself and hold yourself accountable for how many calories you're actually taking in. 3. Don't Be a Plate Cleaner. Don't be a plate cleaner. When you are satisfied with your meal, stop eating. Don't be compelled to finish your whole plate so that you're not wasteful. Now, this can actually be a cultural issue. If you grew up in a place where food was not always guaranteed, then you may have been raised to always clean your plate, because you're not sure when the next meal is coming. So that's a real issue. But if you are in a situation now, where you're actually overweight or obese, then thankfully, that's not your issue anymore. So don't feel obligated to clean off all the food on your plate. What you need to do is that as soon as you feel satiated, stop eating. And here are some ways that you can do that. Once you finish the first serving of your meal, and you go back and get that second helping, just wait ten minutes. And see if your body has time to feel satisfied, to feel satiated. Also, try drinking a glass of water before you eat, and that can help to curb your appetite. For a lot of my patients, apple cider vinegar is helpful. If you put a teaspoon of apple cider vinegar in a glass of water and drink that before a meal, a lot of people they find that that curbs their appetite as well. Another very important thing is to purchase small plates. You should purchase plates that are only 10 inches in diameter, that way you force yourself to have a smaller portion on the plate, and if you just really find it necessary to be a plate cleaner, then at least you're cleaning a smaller plate. And very importantly, not only do I not want you to clean your plate, don't clean up other people's plates either. If your kids leave food leftover, pizza, nuggets, fries, do not go around eating up all that food just so you're not wasteful. That promotes obesity, so don't be a plate cleaner. Do stop eating once you're satisfied. Don't make too many changes too fast. For a lot of people, as soon as they make that resolution that they want to lose weight, they want to lose all of that weight right now, especially in this quick fix society, in which we live. And even though it took them five years to gain the weight, they're going to want to lose it in five minutes. So they run to the store and they try to buy all of these perfect foods to eat, everything clean, everything organic, everything perfect, and they spend hundreds and hundreds of dollars on food, that realistically they know that they don't even like. Also, they restrict too much too fast. They wake up one morning and in one day, they say no carbs, no fat, no beef, no pork, no nothing, no dairy. There's nothing wrong with restricting some of these things, but if you go from all to none, it's a setup. Exercise, of course, it's very healthy. You want to exercise. But for a lot of people who are doing too much too fast, they will join the most expensive gym, find the most intense personal trainer, and sign up for two workouts a day, every day of the week. Knowing they haven't exercised in years. In short, if you do too much too fast, you set yourself up for failure. So don't do too much too fast. Make gradual realistic changes when it comes to your diet, and consult your physician. There are so many tempting diets that we see on TV or read on the internet or hear from our friends and from other people. It makes us want to just snap our fingers and have a quick fix to losing weight. But there's really no such thing as a true quick fix. It's a long term maintenance of healthy weight. So you find all kinds of things. Hey, lose 10 pounds in one week. And there are ways to lose weight very quickly, but if you want to maintain that weight loss, it has to be a lifestyle. So don't fall for the quick fix. Also, don't run and join every new diet that comes out. The keto diet is an absolutely wonderful diet for many people, but it's not for everyone. Adkins is a great diet, but it's not for everyone. Weight loss medications can be very effective, but they're not for everyone. Liposuction, bariatric or weight loss surgery are beautiful tools, but they're not for everyone. Don't look for the quick fix. Do consult your physician and find out which weight loss fitness plan is best for you. Consult your physician and make realistic weight goals. A lot of us just want to lose the pounds, just like that, but for a healthy maintenance of weight loss, once you've reached that steady state, it's safest for most people to lose one to two pounds a week, but again, consult your physician and find out what's best for you. This ends my overview of diet do's and don'ts. Remember, don't be discouraged. I want you to consult your physician and come up with a healthy weight loss and fitness plan for you. As always, I want you to take care of yourself, take care of you. Prioritize yourself. Remember, obesity really is a major epidemic here in the United States, and especially among blacks. Blacks have a higher percentage of obesity than any other ethnic group. So pay attention and take care. Do your best to live your healthiest, happiest life.